Honeymoon Beach is tranquility in paradise. This smaller, yet more spectacular beach offers you beautiful white sand and crystal clear waters. 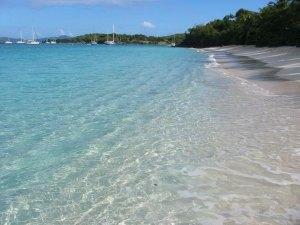 You can access the beach via the Lind Point Hiking Trail that connects Cruz Bay to Honeymoon and Caneel Bay. Why is this beach so exclusive? We think it’s because it’s not accessible by car it is usually not crowded. 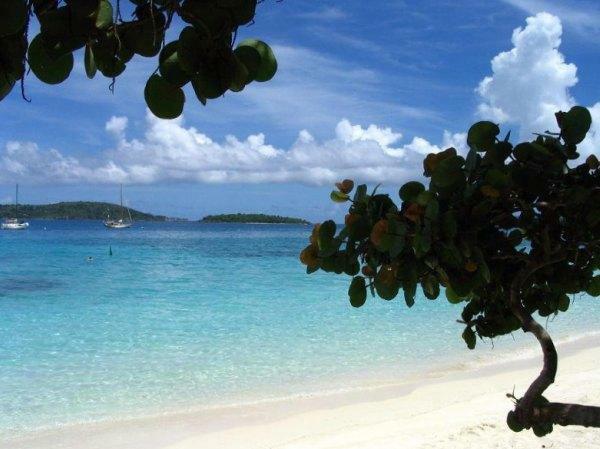 The hiking tours, which are very popular on the island, make this beach a stopping point. Honeymoon Bay is also popular with charter boats from mid-morning to mid-afternoon. And what about under the surface? You will find snorkeling best by the rocky headland that extends into the water between Salomon and Honeymoon Bay. So remember – you can’t drive your SUV rental to this beach. You “can” access it by hiking a bit. The snorkeling is well worth the hike. It’s also accessible by boat. You can hire a sailboat or catamaran to take you to any of these magnificent coves. Remember to take the camera because the photos here do not do it justice. The views are simply breathtaking.